When Apple first introduced the iPod back in 2001, we were all still carrying around CD booklets and Sony Walkmans. We were banging our heads to Train’s “Drops of Jupiter”, Destiny Child’s “Bootylicious”, Shaggy’s “It Wasn’t Me” – one disc at a time. The iPod shattered our perceptions of music, offering digital tracks on a device that touted “1,000 songs in your pocket.” Imagine that. I remember buying my first iPod – a lime green iPod mini. I recall scrolling through my track list on that ever-recognizable circular track pad and selecting my first song – “Almost” by Bowling For Soup. As the chords pulsed through my Apple ear buds, I was utterly amazed. “It sounds like they’re in the room with me,” I remember saying. It was incredible. Fast-forward to 2014. In what seems like no time at all, Apple has pushed the boundaries even further. Take a look at the most recent iPhone 6 – needless to say, we’ve come a long way since the days of black-and-white music-playing bricks. And yet, there’s something nostalgic about Apple’s past. In honor of the 13th anniversary of the iPod, and the bittersweet cancelation of the iPod Classic, let’s take a stroll down mp3 memory lane. It’s 2003. Apple just launched its groundbreaking iTunes Music Store, stocked with 200,000 songs, each priced at just 99¢. Along with their third generation iPod, now lighter than two CDs, the company is on its way to making music industry history – although they don’t know it yet. 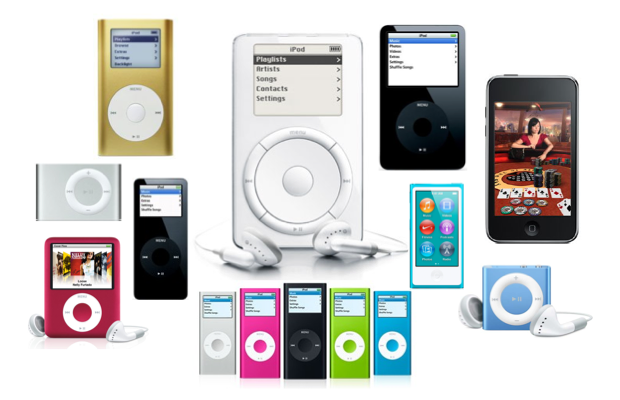 By the end of the year, two million iPods will be sold. 2004. The iPod Mini enters the spotlight, offered in five bright colors. There’s no doubting the success of Apple’s digital music empire, as iTunes downloads reach 50 million songs, and devices reach overseas markets in the UK, France, and Germany. Customers can choose from an array of music players, including a special edition black and red U2 device. In late 2004, color displays are introduced to the iPod Photo. Now customers can upload pictures to their devices and view them on-the-go. The public is wowed again in 2005 when the company rolls out an arsenal of new products – competitors simply cannot keep up. First, a more affordable iPod enters the market: the Shuffle. This cost-effective music player weighs only 0.78 ounces, and plays tracks in a random order. Customers swear that their iPod Shuffles can read their minds – it always plays the perfect song. Of course, this is probably because people only upload songs of their choosing. Soon after comes the iPod Nano. Though the Nano only holds up to 4GB, its slim build and color display represent the future of technology – the Nano quickly becomes the best selling music player ever. And when Apple introduces music videos and television shows to its iTunes Store, their new iPod with video capabilities sees similar success. In 2006, Apple announces its first fitness wearable – a concept that is still widely popular today. A Nike partnership ensues, and customers can now track their workouts on their iPods by syncing the device to an in-shoe sensor. Indeed, 2006 is the year of fitness, as the company also promotes their new second generation Shuffle with a built-in clip, perfect for exercise and other activities on the go. 2007 marks a departure from the traditional click-wheel iPod structure. The innovative iPod Touch introduces multi-touch technology to the music player market, along with wifi connectivity. iPods become so much more than simply music players – users can play games, videos, and even surf the web with just the swipe of a finger. The days of disk-players are long gone. But there’s more. 2007 is also the year of the iPhone. Finally, customers can combine their two devices into one. In the coming years, iTunes out-sells Walmart, becoming the largest retailer in the country. The app store opens, offering customers thousands of tools, games, and features. And iPods continue to get smaller, while their storage continues to grow. It’s certainly been a long journey for the iPod. From click wheels to touch screens, Apple has made mp3 history, one device at a time. The rapid advancements made at the beginning of the new century signified a new age of gadget growth. EvolveEnt is dedicated to the ever-changing evolution of technology, and if there’s any device that follows suit, it’s the iPod.